As some of you may already know, I attended the Massachusetts Conference for Women this past week. At the largest conference of it's kind in the United States, me and 8,000 of my closest friends, all got together for some serious "woman power" moments... and maybe a couple of tearful moments as well. It was one those things, where the night before I was stressed about getting up earlier, getting there on time, looking good but being comfortable... all the things that weigh on me when my "norm" is changed. Once I was settled at my breakfast table, preparing for the first keynotes, I was able to get myself excited and began to feel the energy of everyone around me. I parked myself right up front for the morning keynotes, being that it was first come first served, I am always one to capitalize on this type of opportunity... and girl, was it worth it. The morning keynotes were a very nice mix of empowering and touching, with a dash of brutal honesty that I myself was surprised with. I didn't know what to expect but what I got was a really thought provoking day at this conference. I could go into detail about each and every thing that each speaker relayed to us but I think that wouldn't appeal to each and every one of you. I would rather share the nuggets of wisdom that I gleaned from each speaker because these are the things that will keep me, personally, motivated and I thought could motivate each of you as well. Charlotte Beers, former chairman and CEO of Ogilvy & Mather and former Undersecretary of State (phew!) spoke with a theme about being your own boss and bringing your message to your audience clear cut and powerful. Don't muddy things up, be the communicator you want to be so you can attain your goals. Charlotte is absolutely the kind of strong woman I strive to be. 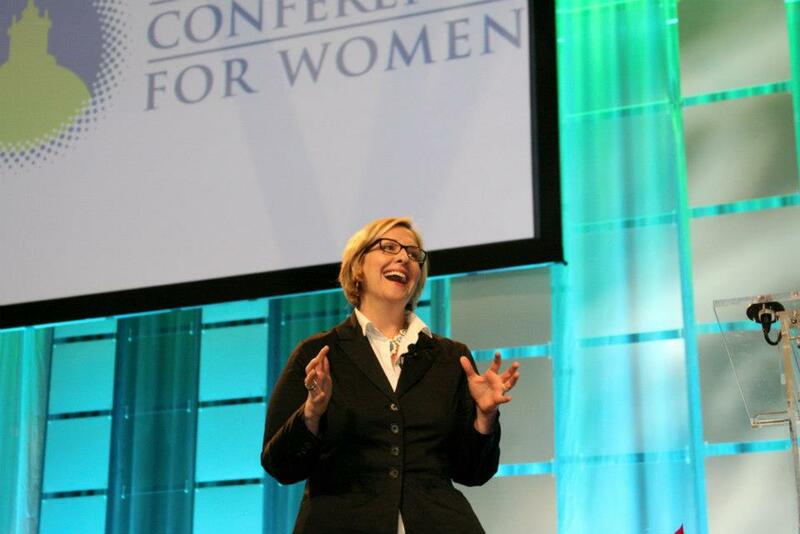 Brene Brown, a research professor at the University of Houston Graduate College of Social Work, has spent the past twelve years studying vulnerability, courage, worthiness, and shame. Brene had to be my biggest "get" from this breakfast. I had no knowledge of her before this day but she brought me to tears at breakfast, which I am not ashamed to say, is not that hard haha. Brene was thoughtful, honest and shared with a group of 8,000 women, what you would share with close girlfriends over coffee, and then some. Deepak Chopra, whom I am sure you all know, was the final speaker at the keynote breakfast. He is a renowned physician, author, internist, and endocrinologist who also happens to be a global force in the field of human empowerment. He opened telling a story about one of the most meaningful people in his life, his mother, and then moved on to explaining why he thinks it's time that women took their place in making this world reach it's full potential. Be sure to keep your eyes peeled for my "Ode to Delia Ephron" and "Lunch Keynotes" posts coming up very soon. You will not be disappointed!